Heads were Remo (Emperor/Ambassador combination top and bottom) brush coated or the Ludwig equivalent. 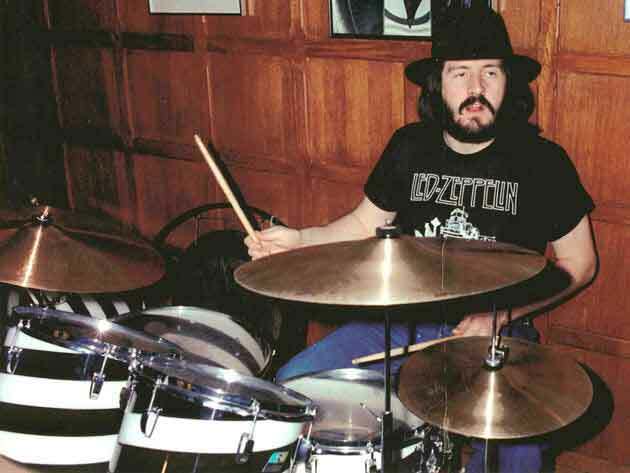 After John Bonham's death, one of the drum kits was given to drum technician Jeff Ocheltree, another was kept by Pat Bonham, John's widow, which at one point were on loan to the Rock And Roll Hall Of Fame in Cleveland, and now resides at the Bonham family home, the Old Hyde Farm in Wolcestershire, England with John's picture over it (see photo below). The third kit was purchased by a collector in upstate New York. 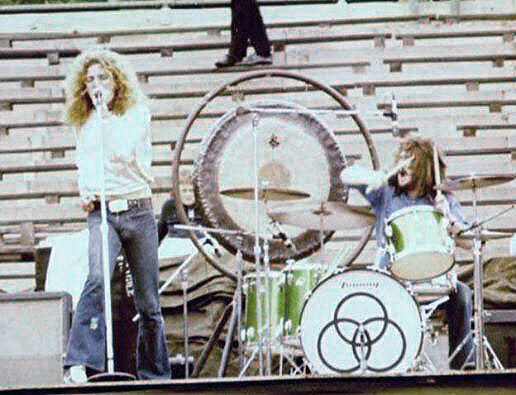 These are the drums that can be heard on Led Zeppelin classics such as Black Dog, Rock And Roll and Stairway To Heaven. 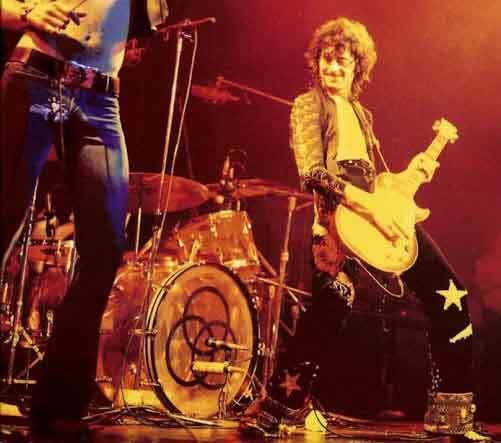 Jimmy Page has mentioned in interviews that he has one of the bass drums in his Sol studio and was used by Jason Bonham during the recording of his 1988 solo album, 'Outrider'. 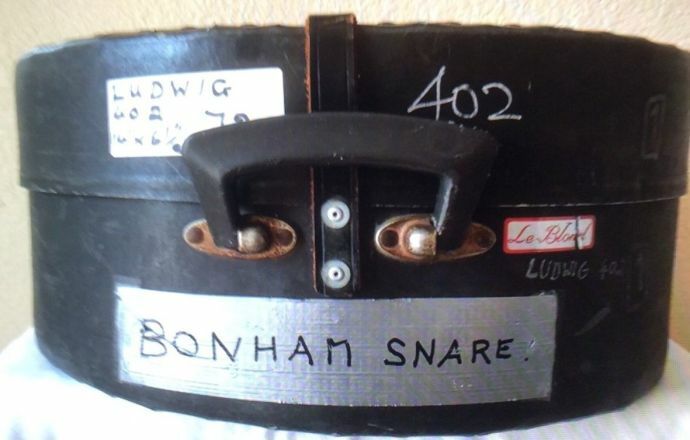 It is likely that this bass drum was a back-up spare that Bonham kept handy on tour from one of the three drum kits that were given to him by Ludwig. 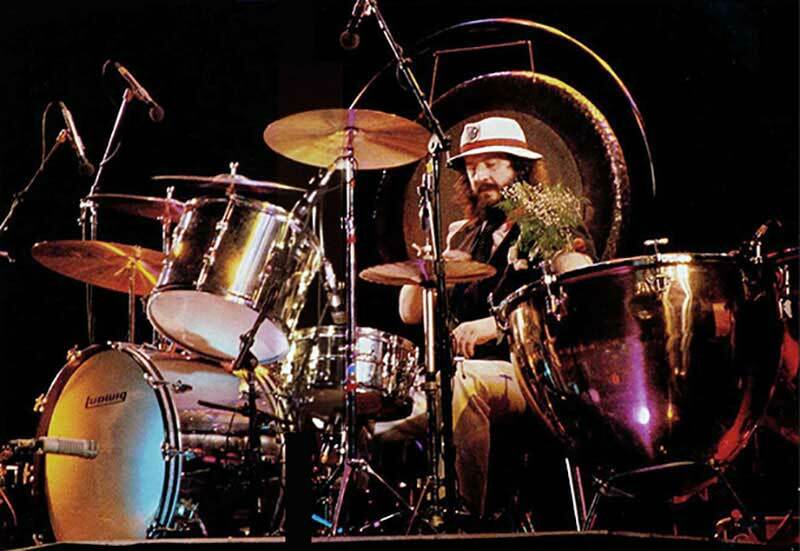 Mick Hinton, who became Bonham's new drum tech in 1971 has said in an interview "I had the other [bass drum] set up as a spare - a 26" bass drum, 14" tom and a cymbal arm mounted on the bass drum. It was an exact replica, tuned the same, so if a skin went, all you had to do was take that part of the kit out. He used a Roger hi-hat pedal and a Ludwig Speed King bass pedal with a wooden beater. He hit the bass drum so hard that sometimes the beater would fly off and he'd put the rod through the bass drum head. It happened the first time and I wasn't expecting it. After that, if I saw the beater go, I'd get in there and pull his foot off the pedal and put another complete Speed King on. Sometimes it was too late because he played so fast." 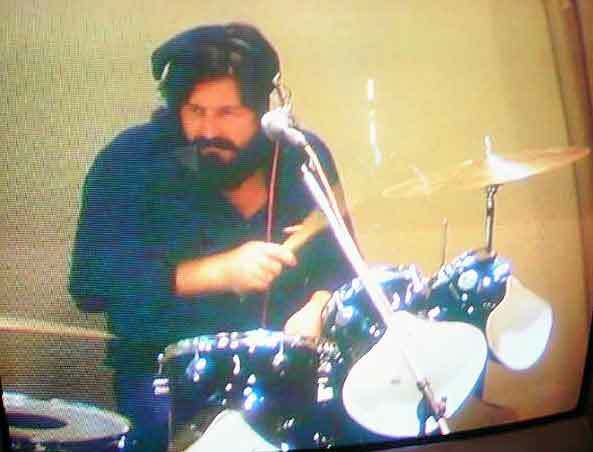 Bonham during recording sessions at Stargroves in England 1972 with the Green Sparkle Kit. The Ludwig Green Sparkle kit made it's debut onstage for the June 22, 1970 concert at Reykjavik in Iceland. 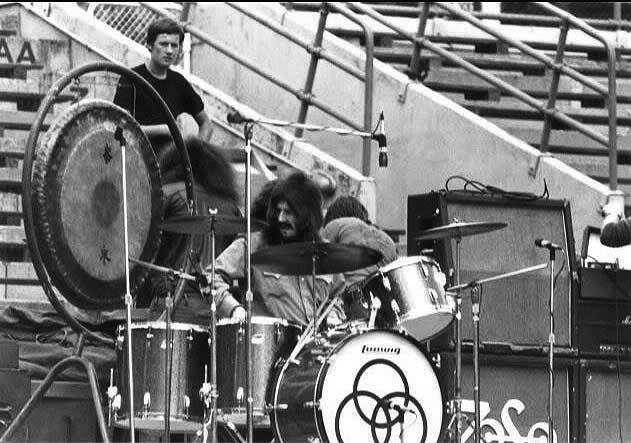 Bonham also had a wooden platform or riser that he had his drum set up on (as can be seen in the bottom left photo). It consisted of sheets of plywood joined together with hinges so that it could be folded up. 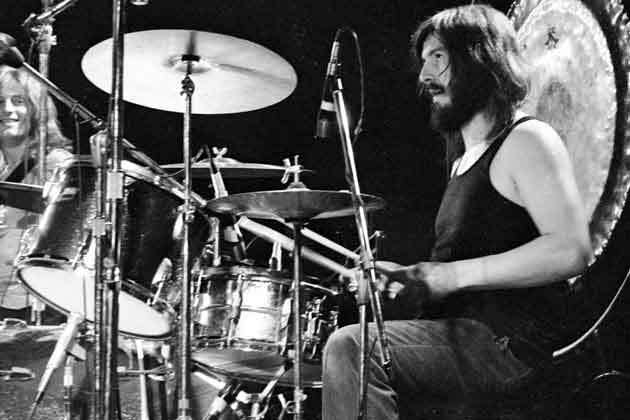 Mick Hinton (who's first gig with Bonham was in Belfast, Ireland on March 5, 1971) has said in an interview, "My job was to have the kit in exactly the same position every night. everything was geared to him playing immediately without making any adjustments. I'd code the stands with different coloured tape, and I used jubilee clips (proto-memory locks) so everything was the same height every night. We had a [wooden] riser with holes drilled for all the tom legs, spurs and hi-hat. The holes were about half-inch deep so everything slotted in. And I'd put a strip of gaffa tape over each leg to stick it to the floor. I got Ludwig to drill holes in the front bass drum hoop so I could stick a bolt through to anchor that bass drum down. if I hadn't anchored that bass drum down I promise you it would have been in row four the first time he hit it." 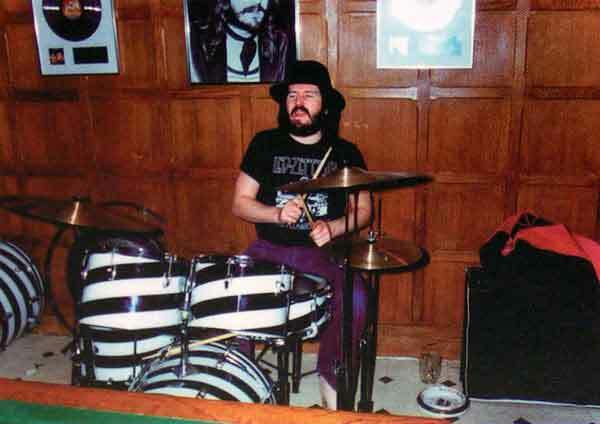 A backshot of Bonham's kit taken April 1, 1973. What's interesting about this photo is the clear drum head on the bass drum batter side and also what looks like on the rack tom as well. 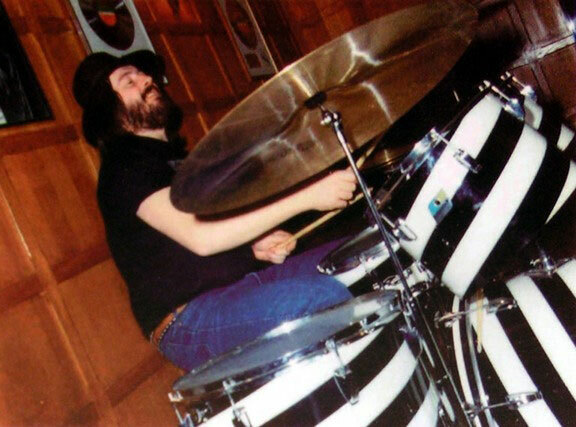 Up until this point, Bonham always previously had coated heads. 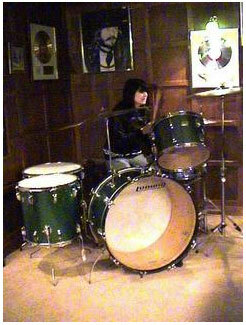 Zoe Bonham (John Bonham's Daughter) on the Green Sparkle kit at the Old Hyde Farm. 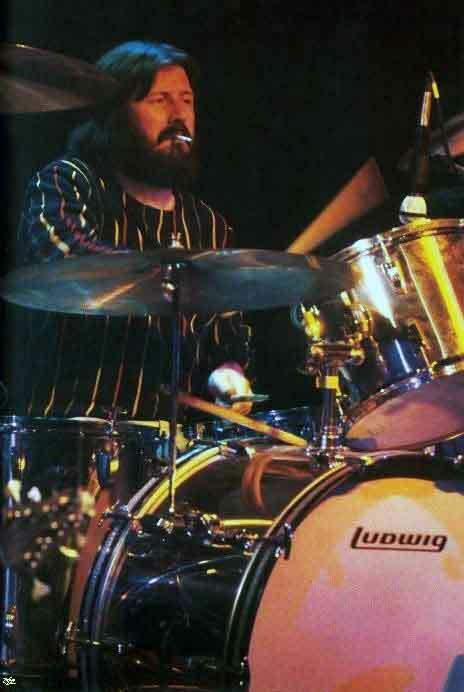 Bonham received his third kit from Ludwig in March 1973 and was to become his most famous kit, the Amber Vistalite Kit. 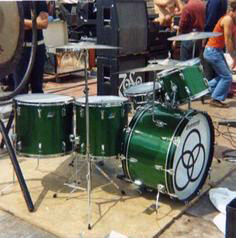 This kit is forever immortalised in the Led Zeppelin movie, 'The Song Remains The Same', released in 1976. 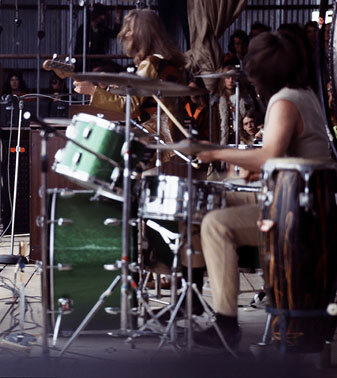 The kit was first used on stage at the concert on May 4, 1973 in Atlanta, Georgia. USA. There are some sources that claim that in addition to the 16"x16" & 16"x18" floor toms supplied with the kit, a larger 16"x20" & a 16"x22" floor tom were also supplied and alternated with the smaller ones at varying times during the tour, especially during the filming for 'The Song Remains The Same' over some of the three nights at Madison Square Gardens in New York in 1973. Also another bass drum was also supplied (likely used as a back-up). Clear Black Dot CS Remo heads were also used for the batter sides and clear Ambassadors for the resonate sides. The only muffling used was on the bass drum with a felt strip laid horizontally on the lower part of the batter head, and a 'reso' or 'Ritchie' ring on the front head (see bottom photo). 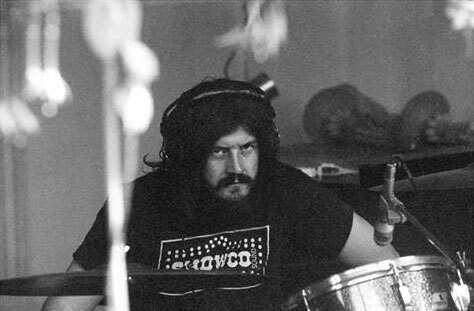 Mick Hinton, Bonham's drum tech in the early to mid 70's also said in an interview that "he used a Rogers hi-hat pedal and Ludwig Speed King bass pedal with a wooden beater. Every tour, Ludwig supplied one gross (144) pairs of 2A hickory sticks. We used Remo CS black dot heads." (likely referring to Bonham's period with the Amber Vistalite kit). 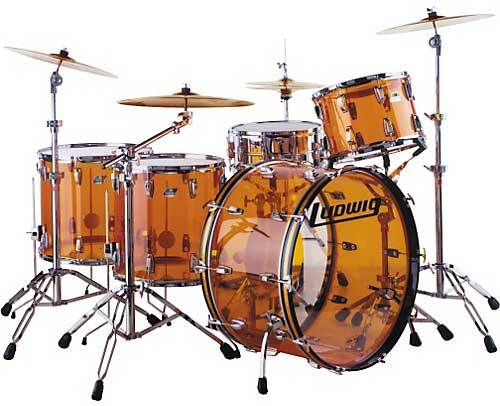 In the early to mid 2000's, Ludwig released a reissue John Bonham Amber Vistalite kit in the same sizes and finish that Bonham used. 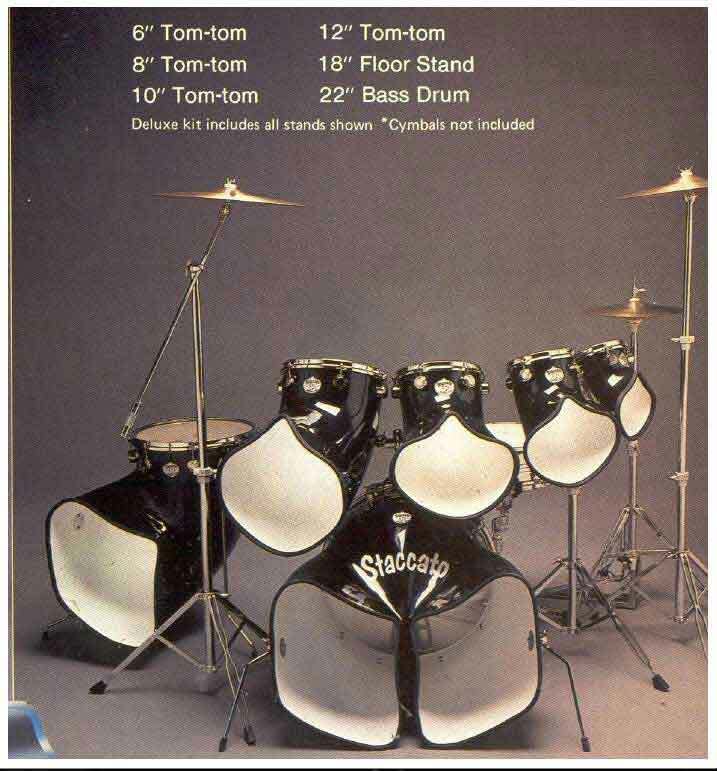 These kits however did not include internal dampeners or the rail and L-cymbal mounts on the bass drum as Bonham's original kit did. 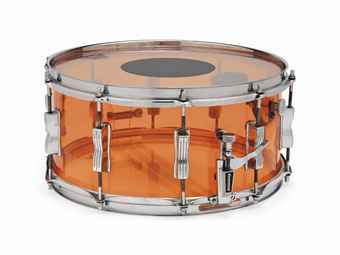 A Vistalite snare drum supposedly once owned by John Bonham went up for auction via Christies in June 2014. 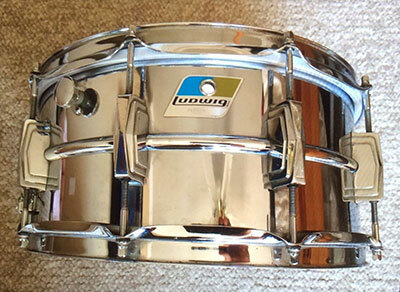 The auction ad claims he used this snare through 1973-1975. 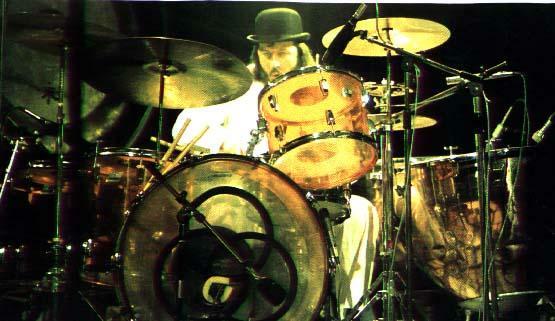 Although Bonham did indeed use an Amber Vistalite kit during this period, he still used a Ludwig Supraphonic metal snare. 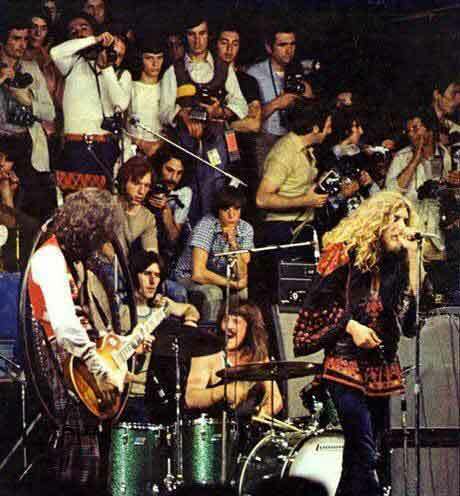 It's possible the Vistalite snare was supplied with the Vistalite kit and Bonham kept it in storage. The auction link can be viewed here. The Ludwig Silver Sparkle drum-kit was rumoured to have only been used in the studio to record 'Presence' in November 1975. Other sources claim it was actually the green sparkle kit. 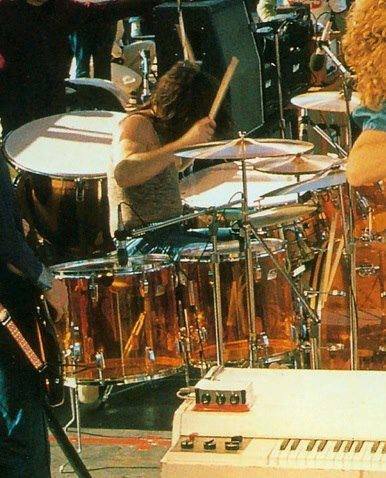 The above live photo has often been confused for the Ludwig Silver Sparkle kit due the the lighting, but is actually the Ludwig Green Sparkle kit taken in late 1972 (if you look at the finish closely). 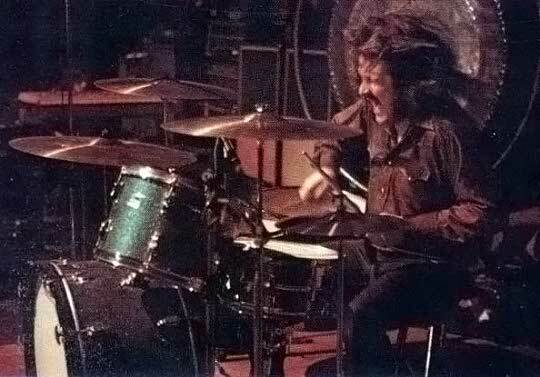 No photos of Bonham on a silver sparkle kit have ever surfaced to date. 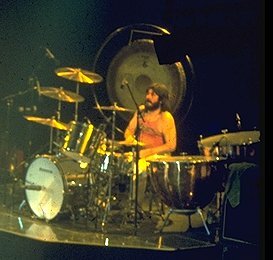 Another photo possibly taken at the same show as the upper photo (Bonham is wearing the same shirt) and clearly is using the Ludwig Green Sparkle kit. 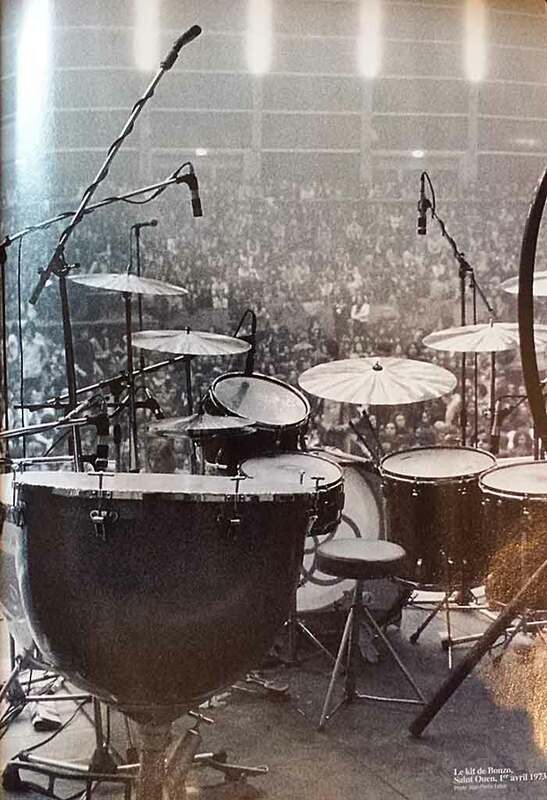 The Ludwig Stainless Steel Kit shown here on June 8, 1977 at Madison Square Gardens, New York. 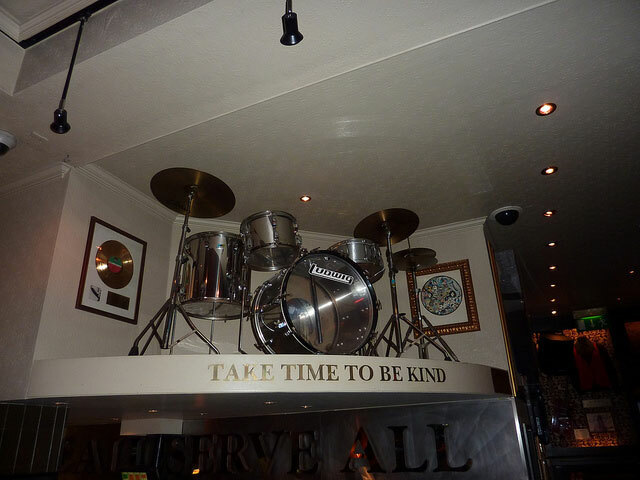 A replica Stainless Steel Ludwig Kit on display at the Hard Rock Cafe in London (with 6.5"x14" stainless steel snare). Bonham also substituted the 12"x15" mounted tom (with Mach full length lugs) with a 10"x14" version with standard Ludwig tom lugs as can be seen in the above bottom two photos. 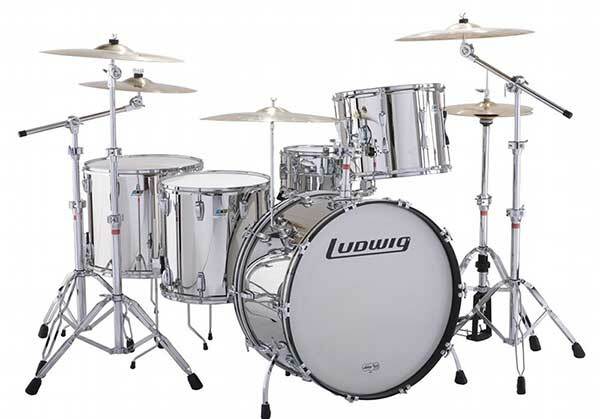 In the early to mid 2000's, Ludwig released a reissue John Bonham stainless Steel kit in the same sizes that Bonham used, which included the full length mach lugs on the rack tom and a L-cymbal mount on the bass drum. 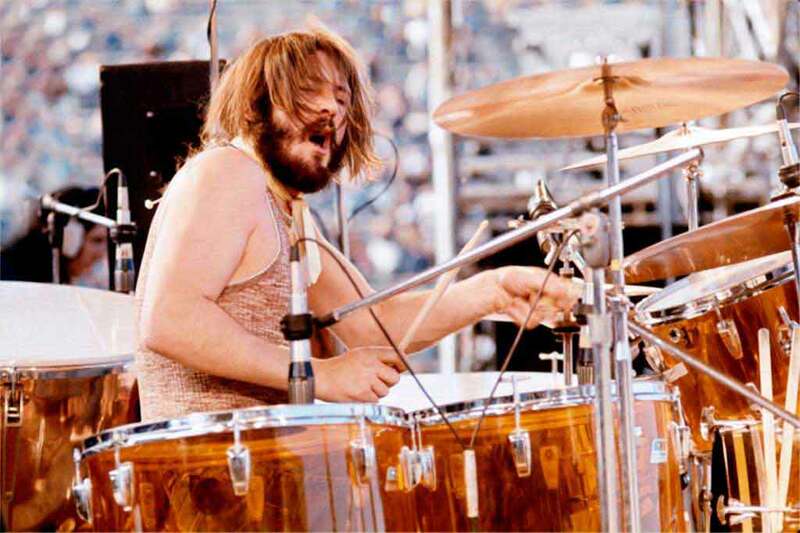 Bonham gave some of the drum pieces to rock journalist Chris Welch which Welch then used the drum-kit for a few years in jazz bands. He eventually sold it to Phil Harris of Harris Hire Vintage Musical Instruments in 1998 for £950. Over the years, the drum-kit has been used by some notable musicians, including Robbie Williams, Shawn Drover from Megadeth and Manic Street Preachers. The drum-kit may have been acquired by Fleetwood Mac drummer Mick Fleetwood at some point. 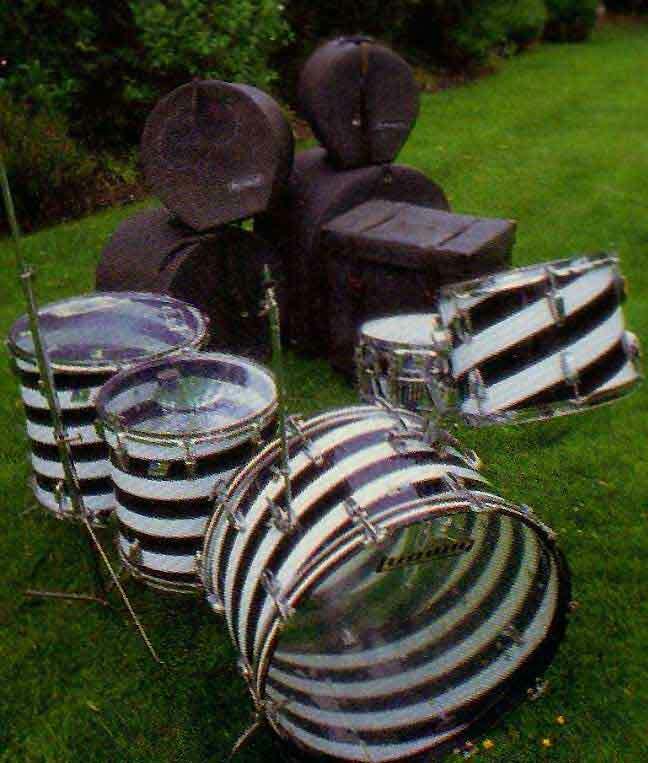 On September 4, 2008, the Black & White Spiral Ludwig Vistalite drum-kit was sold at The Fame Bureau auction house for $41,000 to an unknown buyer. 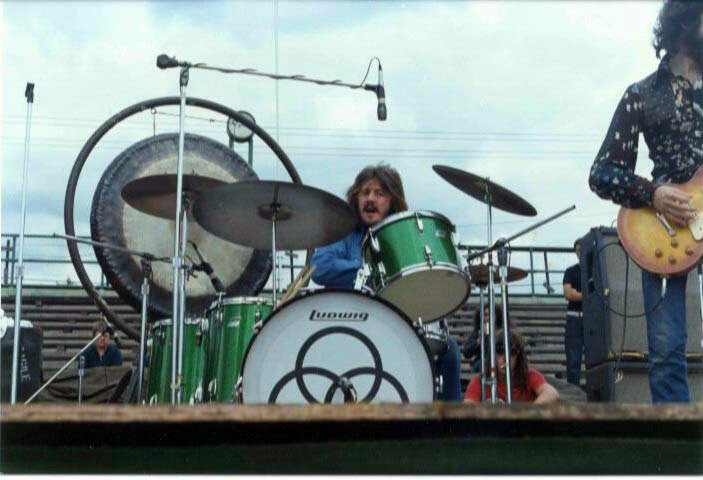 The remaining pieces (shown in the first three upper photos, set up with the concert toms) are now in possession of John Bonham's daughter, Zoe. 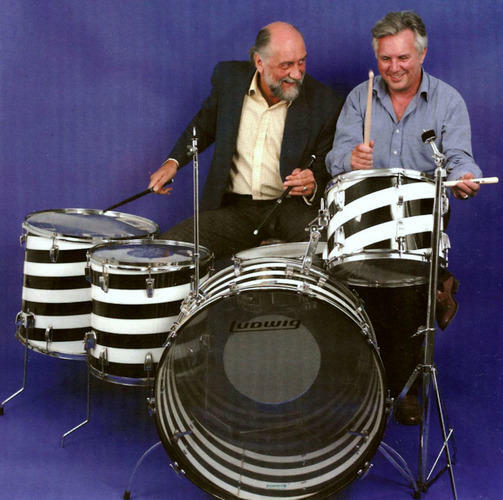 Mick Fleetwood & Ted Owen of The Fame Bureau, London, England, ca. September 2008. The Ludwig 6.5"x14" Supraphonic 402 snare drum along with the road case from this kit was eventually auctioned off on Ebay for US$17,000. 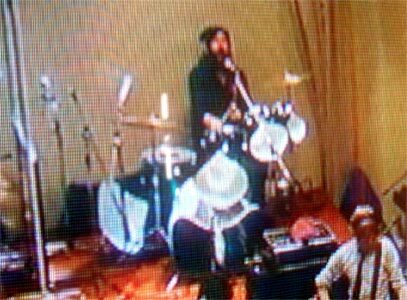 Dave Grohl (Foo Fighters and ex Nirvana) is said to also own one of Bonham's Supraphonic 402 snare drums. 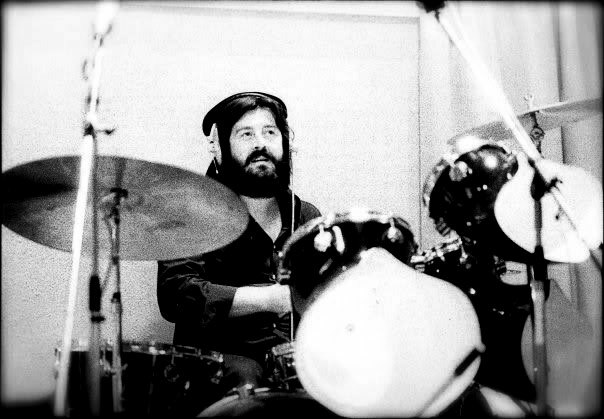 John Bonham was invited to be involved in the recording of two songs, 'So Glad To See You Here' and 'Rockestra Theme' with Paul McCartney and the Rockestra Orchestra on October 03, 1978 at Abbey Road Studios, City of Westminster, London, England. 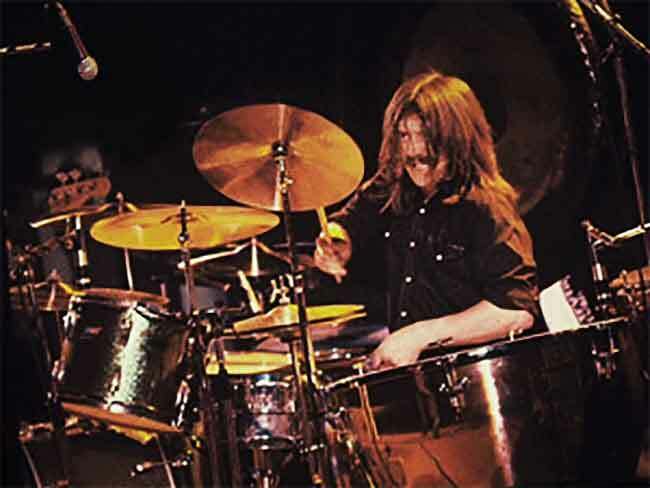 For this session Bonham used a Staccato Voyager 6 Drum-kit with its distinct, curved design of concert toms or single headed drums. The two tracks can be found on The Wings' 1979 album 'Return to the Egg'. 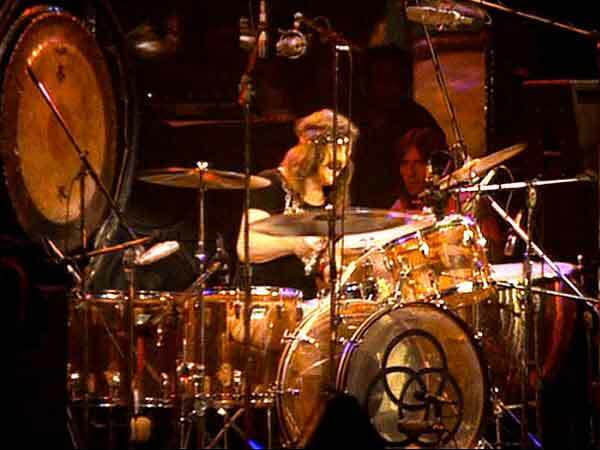 The Rockestra Theme was performed live at the Concert for the People of Kampuchea at the Hammersmith Odeon, London, England on December 29, 1979, however Bonham used the Ludwig Stainless Steel Drum-kit for this show. The fiberglass-shelled Staccato Voyager 6 Drum-kit features 6", 8", 10" & 12" Rack Toms, an 18" Floor Tom and a 22" Bass Drum.